Are you someone in late 20’s or early 30’s. If you take good care of your skin in your 20’s and early 30’s by introducing anti-aging skincare to your daily routine, you will have the benefit of a long-time skincare regimen to keep your skin healthy. Regular day and night CTM routine, using good sunscreen daily and making sure that your skin stays hydrated, are all essential for a wonderful healthy skin. in the coming years. If you never took care of your skin or never cared about your skincare routine – Don’t worry. It’s never too late to start the anti-aging process by using the right skincare products on a regular basis. 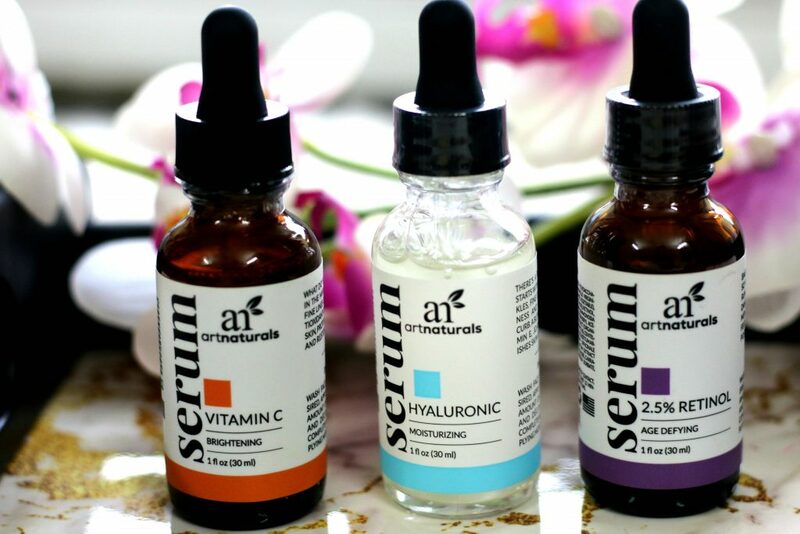 In this post, I am introducing a Anti-Aging Set with Vitamin C Serum, Retinol Serum, and Hyaluronic Serum from artNaturals. It’s is an ideal skincare set that can you can begin with. 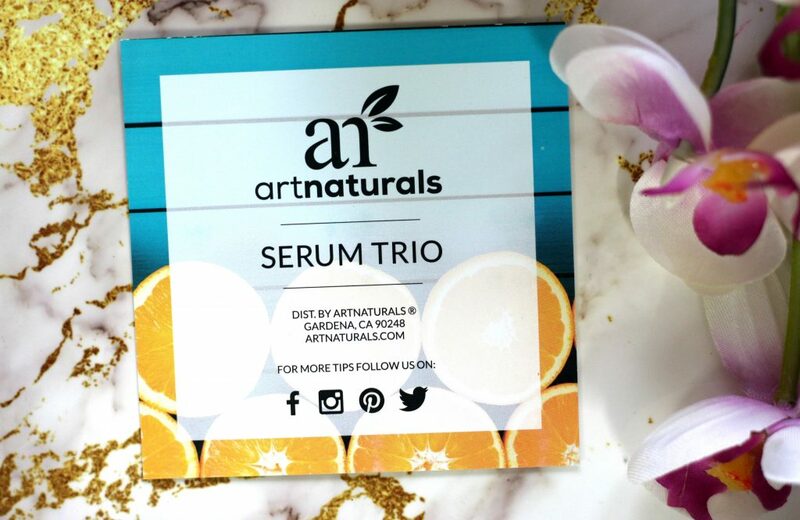 Art Naturals Serum Trio Set is a Anti-Aging Set with Vitamin C Serum, Retinol Serum, and Hyaluronic Serum and thus forms an ideal skincare team. 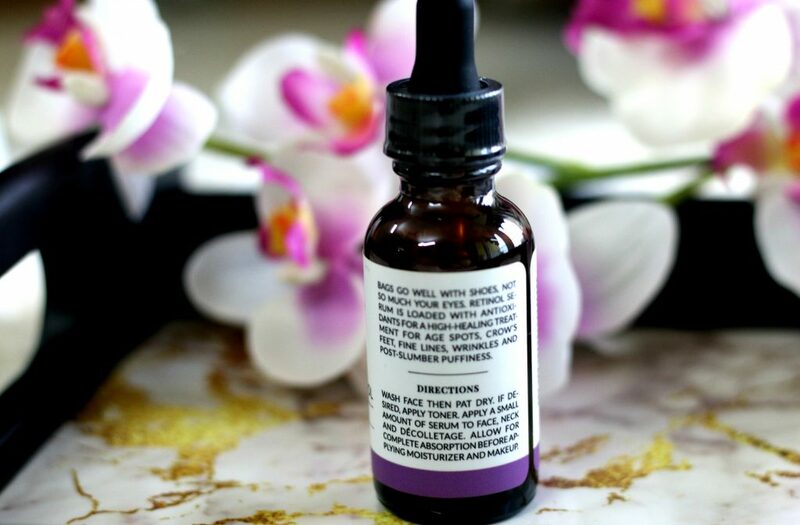 Its anti-wrinkle power also helps reduce dark circles, fine lines, and damage from the sun’s UV rays. 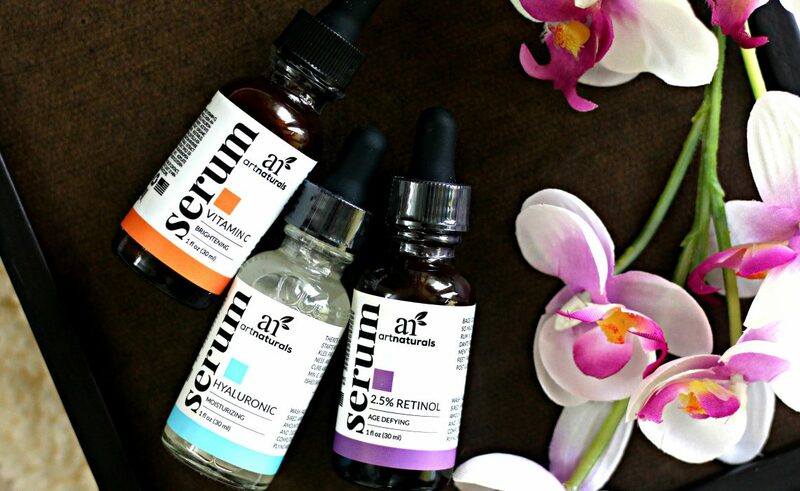 All natural, the serums combine in moisturizing and protecting skin. 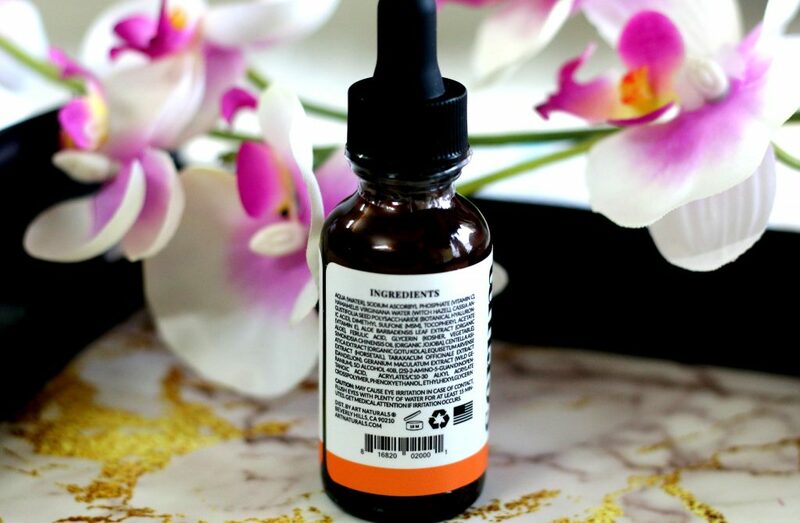 The Vitamin C Serum blends its Vitamin C with antioxidant Vitamin E, soothing Aloe Vera, and other botanical extracts that target signs of aging. 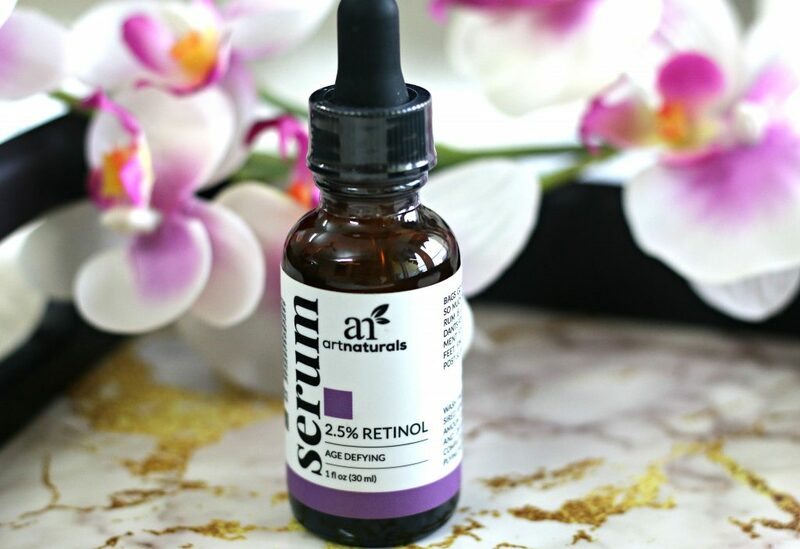 Our 2.5% Retinol Serum helps increase collagen production, and aids in diminishing under-eye bags and crow’s feet. 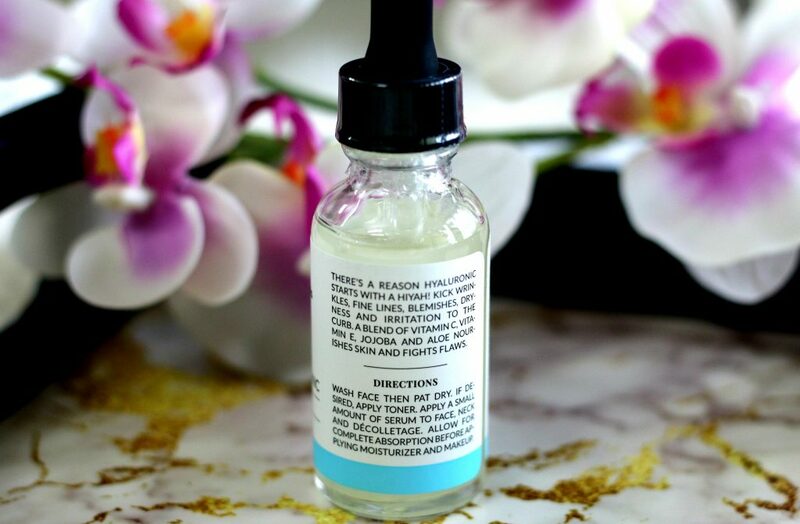 The Hyaluronic Serum is based on Hyaluronic Acid, which occurs naturally in skin, and deeply re-hydrates. 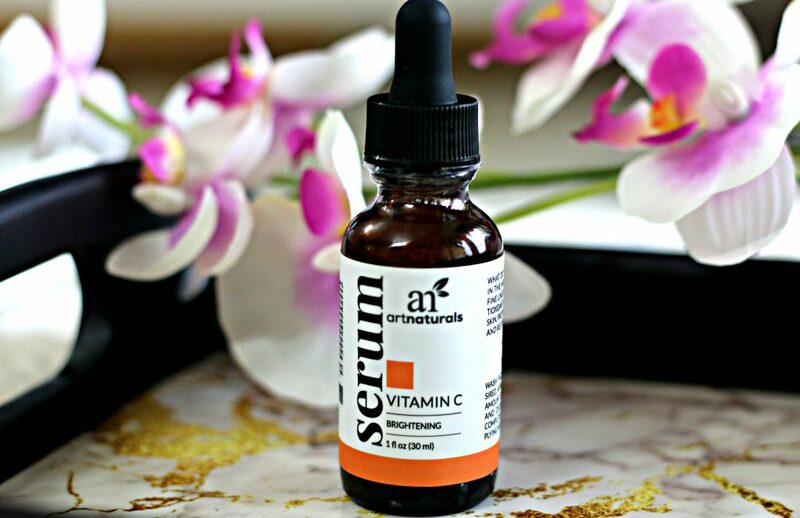 artNaturals Vitamin C serum is specially formulated to target and banish lines, wrinkles, age and sun spots with our Vitamin C Serum with Hyaluronic Acid. 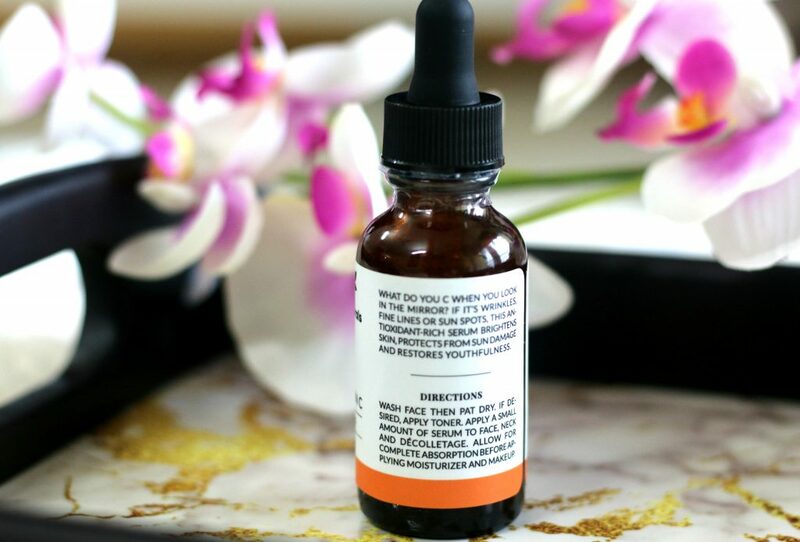 Aging skin and skin damaged by the sun’s UV rays both benefit from the Serum’s antioxidants, enhanced by the addition of Vitamin E. Blend in the inflammation and redness fighter Hyaluronic Acid, soothing Aloe, and hydrating Jojoba Oil and you’ve got a recipe for reviving collagen production and restoring skin’s natural radiance. 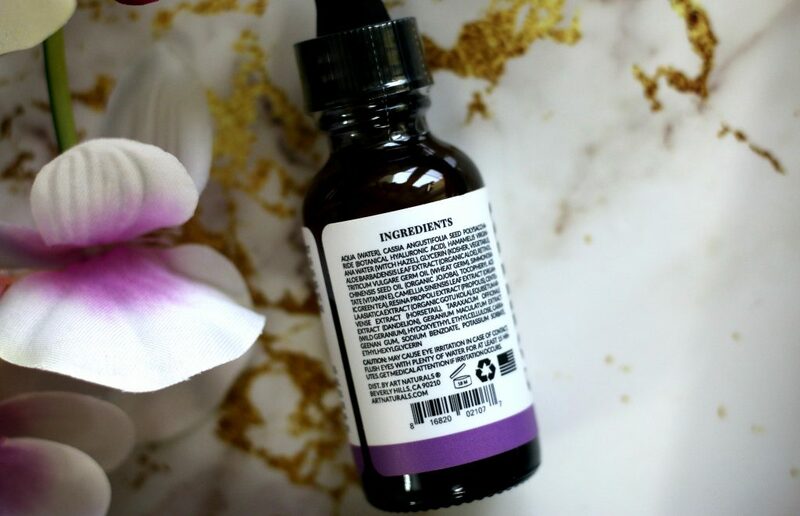 Other ingredients include Gotu Kola to diminish crow’s feet and dark spots, Horsetail Extract to keep skin germ-free, Dandelion Extract for skin’s tone, and Wild Geranium Extract to brighten and tighten skin. Vitamin C Serum Ingredients: Aqua (Water), Sodium Ascorbyl Phosphate (Vitamin C), Hamamelis Virginiana Water (Witch Hazel), Cassia Angustifolia Seed Polysaccharide (Botanical Hyaluronic Acid), Dimethyl Sulfone (MSM), Tocopheryl Acetate (Vitamin E), Aloe Barbadensis Leaf Extract (Organic Aloe), Ferulic Acid, Glycerin (Kosher, Vegetable), Simmondsia Chinensis Oil (Organic Jojoba), Centella Asiatica Extract (Organic Gotu Kola), Equisetum Arvense Extract (Horsetail), Taraxacum Officinale Extract (Dandelion), Geranium Maculatum Extract (Wild Geranium), SD Alcohol 40B, (2s)-2-Amino-5-Guanidinopentanoic Acid, Acrylates/C10-30 Alkyl Acrylate Crosspolymer, Phenoxyethanol, Ethylhexylglycerin. 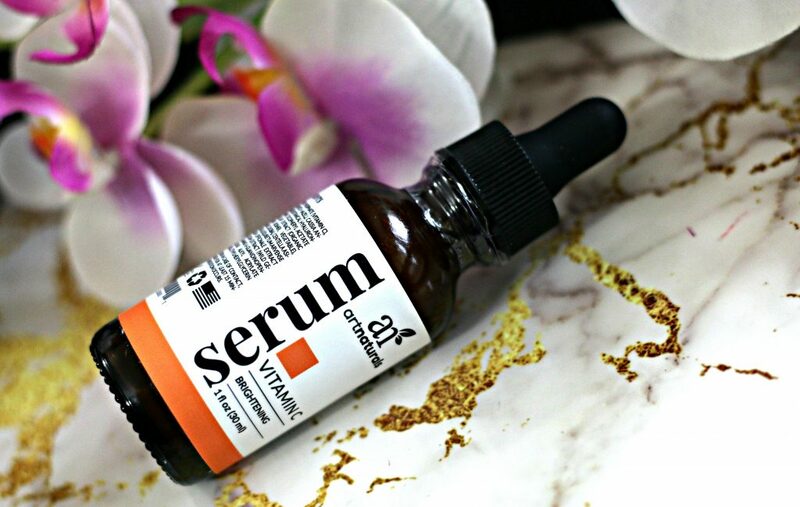 How to apply vitamin c serum? Take the desired amount of serum on your fingertips and generously rub on the intended areas of the face. The product you use may be only for spot treatment or appropriate for full-face application. Once applied, allow the serum to set for 10 minutes. Then, proceed to use a moisturizer and any other makeup products. 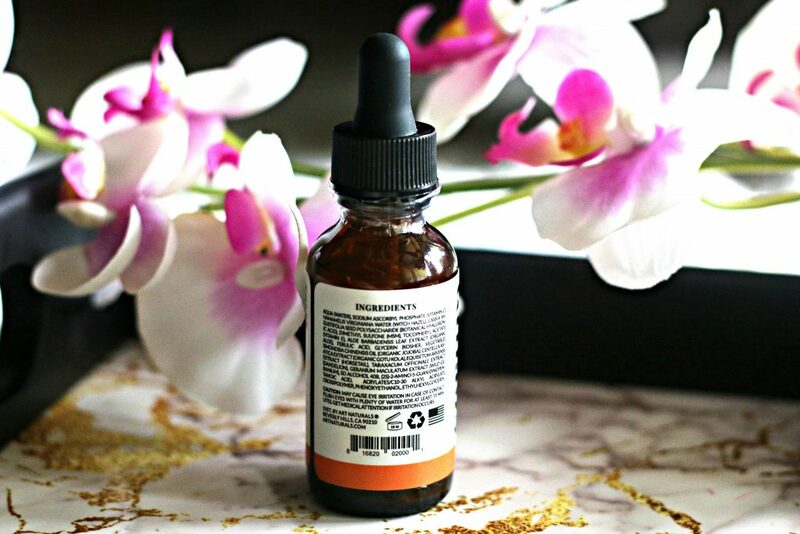 How do I prep before using vitamin c serum? First cleanse your face with warm water and a mild cleanser. Use any toning products before continuing. Allow the face to completely dry before applying the serum. 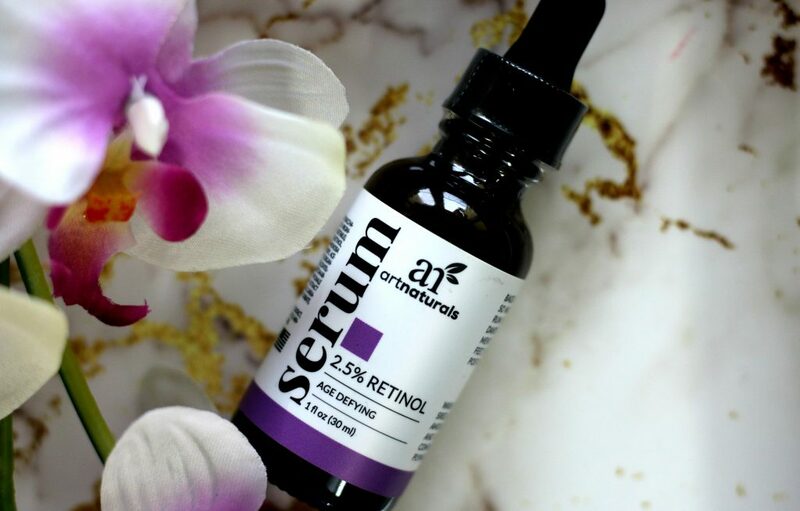 artNaturals 2.5% Retinol Serum is a night anti-aging therapy, as its natural extracts help power anti-wrinkle renewal and aid in reducing dark circles, fine lines and dark spots through exfoliation. Its antioxidants assist in boosting collagen production as they help firm and repair skin. All-natural botanical Hyaluronic Acid helps to deeply moisturize skin as you sleep. 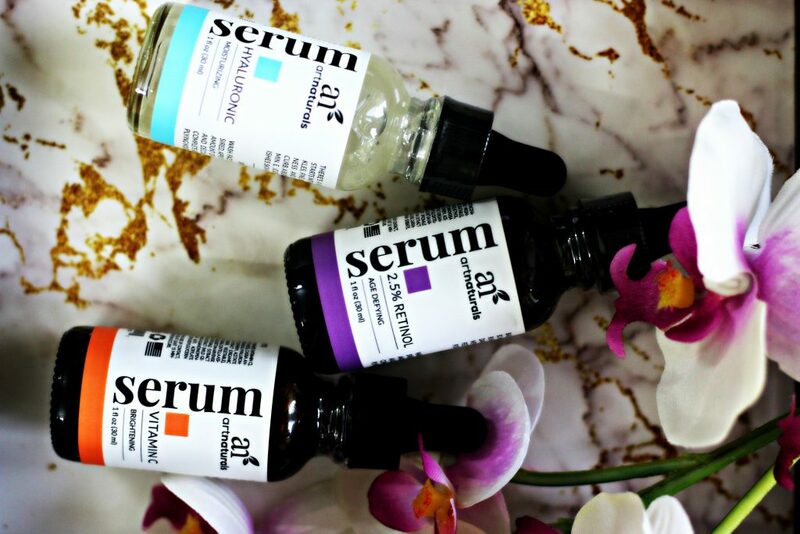 The Serum’s formula also includes hydrating Aloe Vera, along with Wheat Germ, Jojoba Oil, and Vitamin E, to help soothe and soften. Retinol’s exfoliating benefits can also help diminish acne, blackheads and other skin irritations. 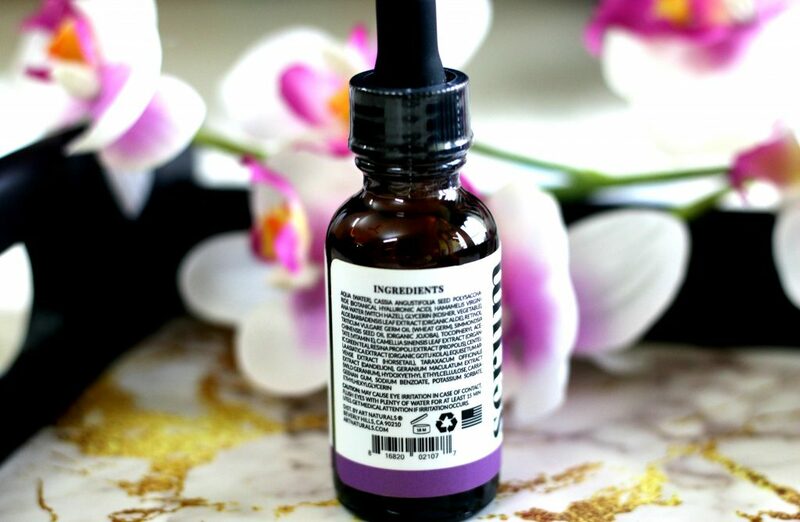 Ingredients of 2.5% Retinol Serum: Aqua (Water), Cassia Angustifolia Seed Polysaccharide (Botanical Hyaluronic Acid), Hamamelis Virginiana Water (Witch Hazel), Glycerin (Kosher, Vegetable), Aloe Barbadensis Leaf Extract (Organic Aloe), Retinol, Triticum Vulgare Germ Oil (Wheat Germ), Simmondsia Chinensis Seed Oil (Organic Jojoba), Tocopheryl Acetate (Vitamin E), Camellia Sinensis Leaf Extract (Organic Green Tea), Resina Propoli Extract (Propolis), Centella Asiatica Extract (Organic Gotu Kola), Equisetum Arvense Extract (Horsetail), Taraxacum Officinale Extract (Dandelion), Geranium Maculatum Extract (Wild Geranium), Hydroxyethyl Ethylcellulose, Carrageenan Gum, Sodium Benzoate, Potassium Sorbate, Ethylhexylglycerin. How to use this retinol serum ? 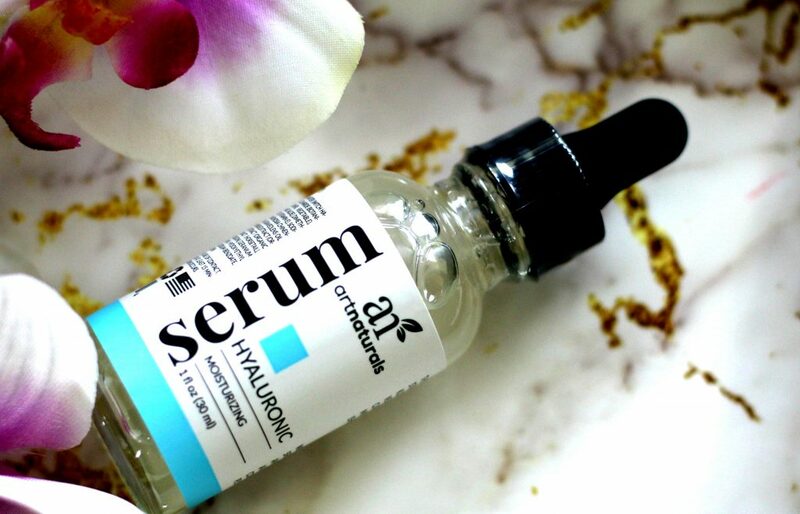 artNaturals Hyaluronic Acid Serum uses a natural component of the skin’s own anti-aging arsenal, and combines it with multiple botanicals extracts and oils to fight and fill wrinkles and fine lines. 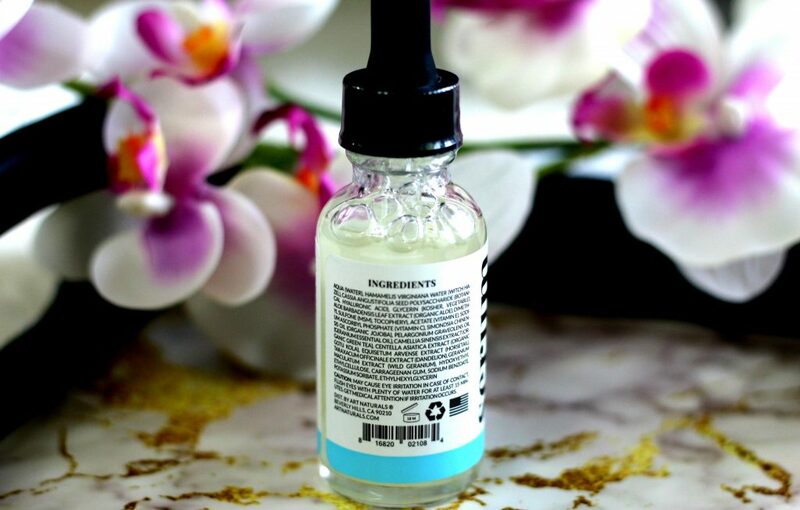 The Serum helps skin retain moisture and smooths rough texture. Can also be used as a deeply-hydrating under-eye serum to help reduce the appearance of crow’s feet and under eye bags. The combination of pure, professional-grade Hyaluronic Acid with antioxidants Vitamins C and E, help fight environmental free radicals that accelerate skin’s aging. Contains Jojoba Oil for additional moisturization, Aloe Vera to soothe, and green tea extract to stimulate and rejuvenate skin. 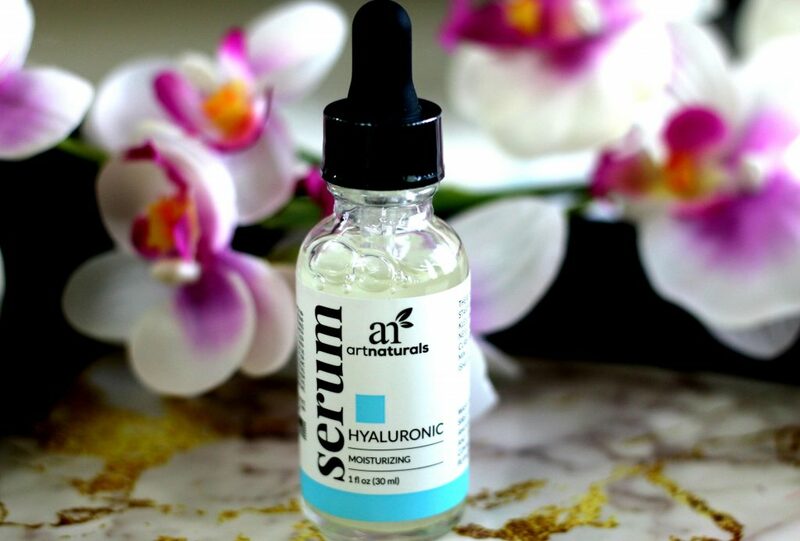 Ingredients of Hyaluronic Serum: Aqua (Water), Hamamelis Virginiana Water (Witch Hazel), Cassia Angustifolia Seed Polysaccharide (Botanical Hyaluronic Acid), Glycerin (Kosher, Vegetable), Aloe Barbadensis Leaf Extract (Organic Aloe), Dimethyl Sulfone (MSM), Tocopheryl Acetate (Vitamin E), Sodium Ascorbyl Phosphate (Vitamin C), Simmondsia Chinensis Oil (Organic Jojoba), Pelargonium Graveolens Oil (Geranium Essential Oil), Camellia Sinensis Extract (Organic Green Tea), Centella Asiatica Extract (Organic Gotu Kola), Equisetum Arvense Extract (Horsetail), Taraxacum Officinale Extract (Dandelion), Geranium Maculatum Extract (Wild Geranium), Hydroxyethyl Ethylcellulose, Carrageenan Gum, Sodium Benzoate, Potassium Sorbate, Ethylhexylglycerin. Use morning and night on a freshly-cleansed face. Massage 1-3 drops across face neck, and chest. How does hyaluronic acid serum can help improve skin? One of the reasons that people get clogged pores is due to dirt and pollutants in the environment. These tiny bits of dirt end up getting into pores where they eventually turn into blackheads or whiteheads. He more dirt clogs the pores, the larger they become. Pores easily get stretched out when they are filled with dirt. 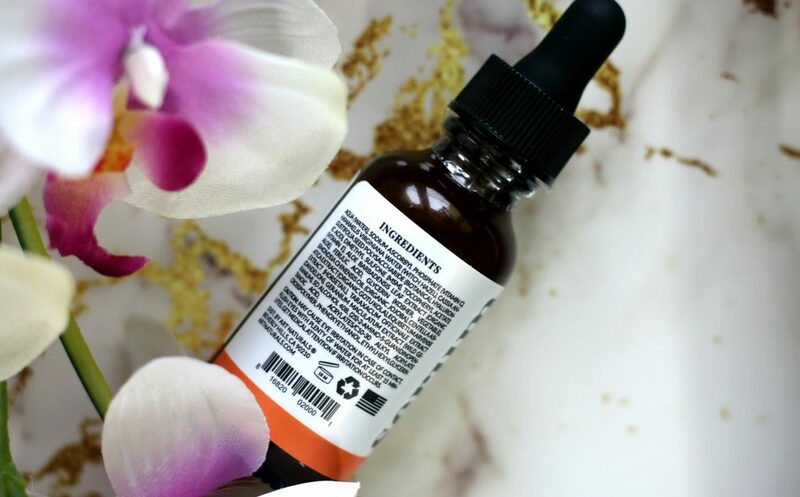 Hyaluronic acid serum effectively supports your skins natural barriers, so moisture comes in but pollutants are filtered out. 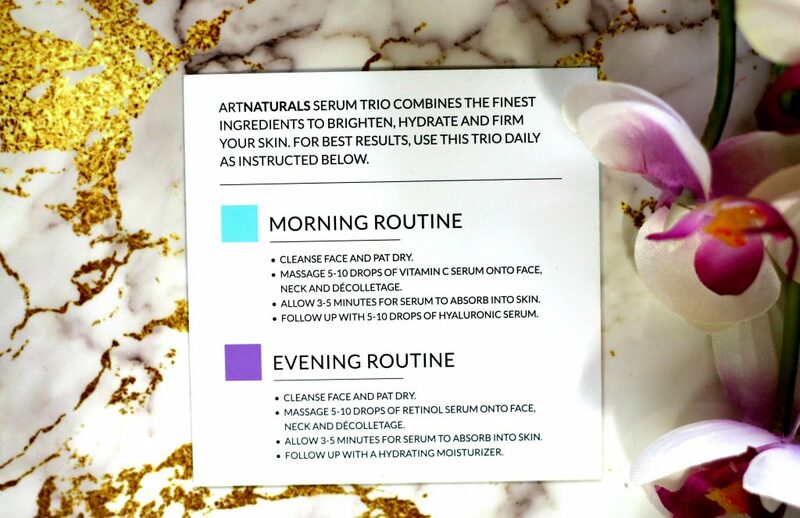 Overall, If you are in your late 20’s and early 30’s – This serum trio is perfect for you. You will need to add a cleanser and sunscreen to have a complete skincare set! 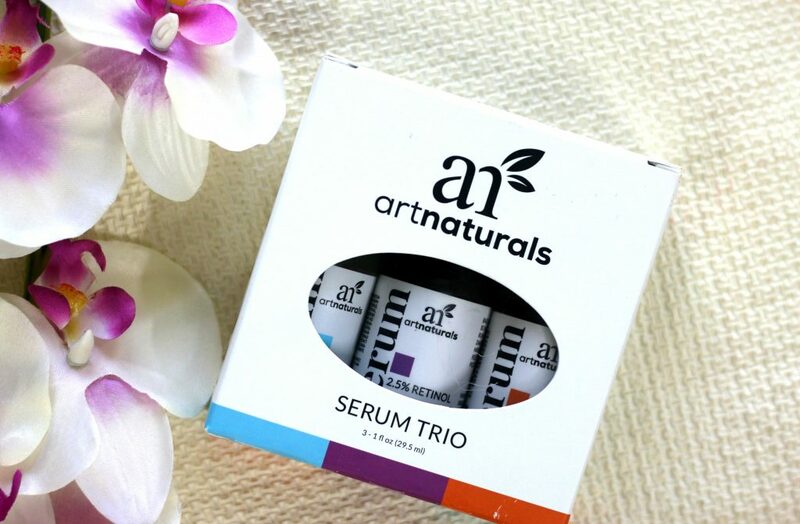 The Art Naturals Serum Trio Set includes 1-oz. 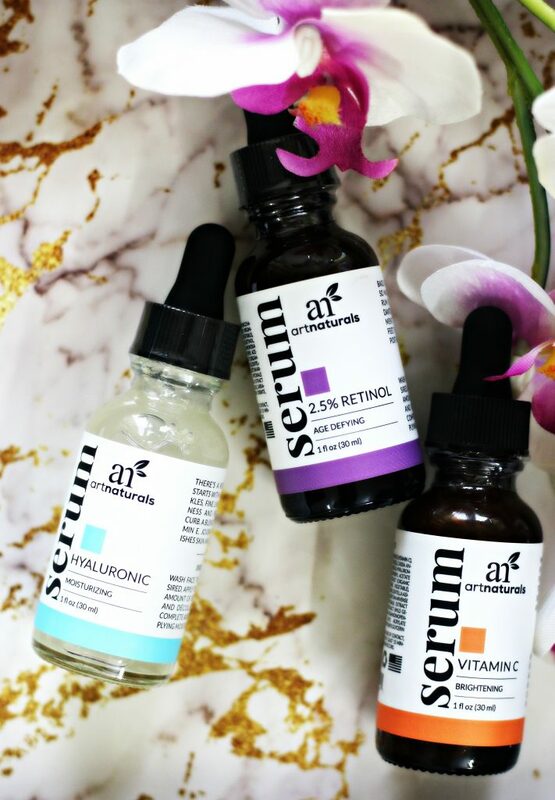 size each of Art Naturals’ Vitamin C Serum, Retinol Serum and Hyaluronic Acid Serum. The bottles placed together in a nice box makes it a great skincare gift. I love Art Naturals products as they use natural ingredients and all of the products have been wonderful on my skin and hair. 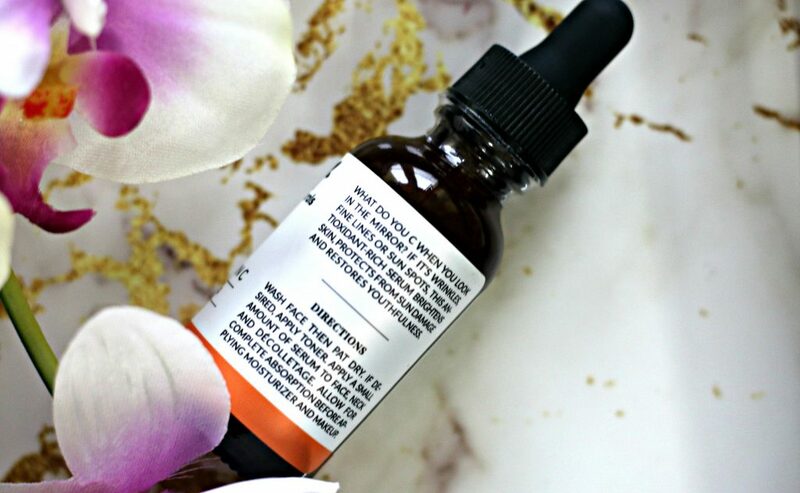 If you are someone suffering from uneven skintone, acne leftover marks, spots etc – Vitamin C serum is perfect for you. Retinol serum is 2.5% retinol which is great for smoothing and plumping the skin. Very importantly – it’s to be used during night and all retinol products can make skin super sensitive towards sun. So, make sure you use a good sunscreen with a higher spf . Avoid sun exposure if possible. The retinol serum is for night time skin care and the vitamin c serum is for day time skincare. They both deliver lots of benefits in the short term as well as long term, and they can be used alone because they already have hyaluronic acid. 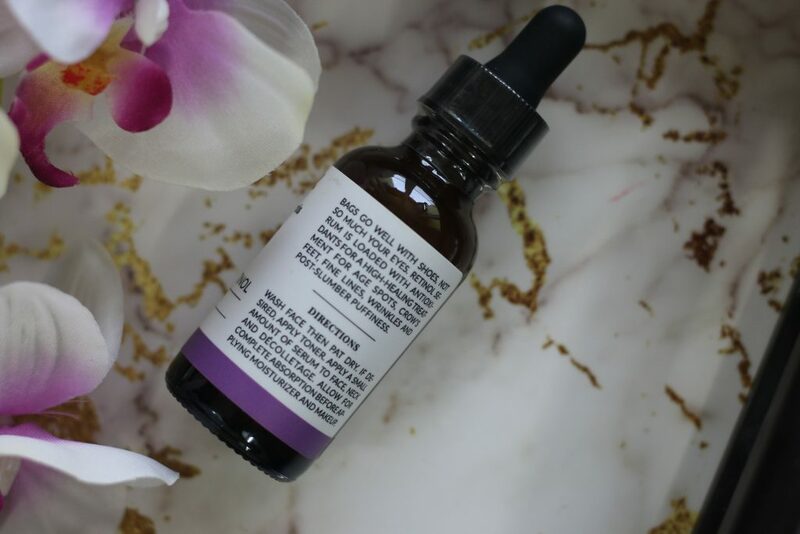 If you are someone who suffer from enlarged pores issue or clogged pores etc – The hyaluronic acid serum has the immediate effect of tightening your skin and shrinking your pores, and can be used anytime alone or in combination with either of the other two serum. Also, let’s not forget that these are serums and not substitute to creams. While they have some moisturizing effect, they have very little emollients (for example, good quality lipids). So you should consider applying a moisturizer after the serum, especially at night. Moisturiser such as Kiehls Ultra Facial Night cream or Murad Night Cream. Make sure you apply sunscreen during the day, especially when you include retinol for night skincare routine. 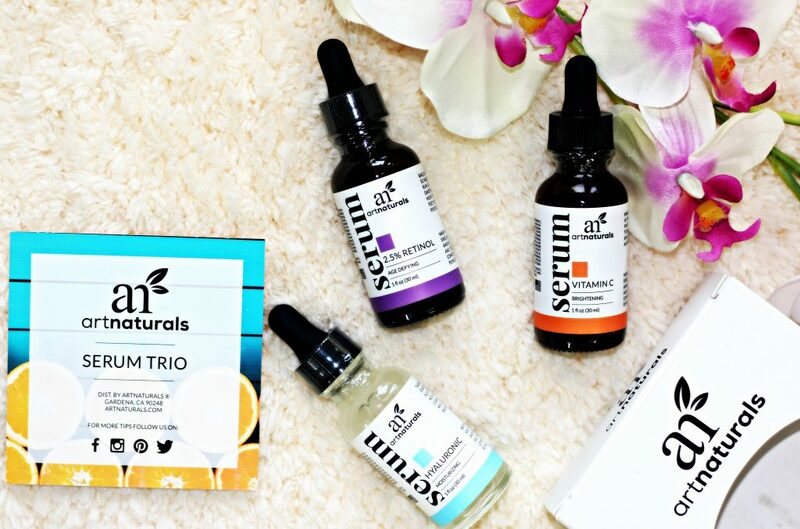 So, why waiting, Wage a war against fine lines, wrinkles, and skin blemishes with this 3-piece anti-aging serum set that contains a Vitamin C serum, retinol serum, and hyaluronic acid serum. It can be used for all skin types, including sensitive skin. This set helps improve complexion while boosting collagen production thus evening out skin. 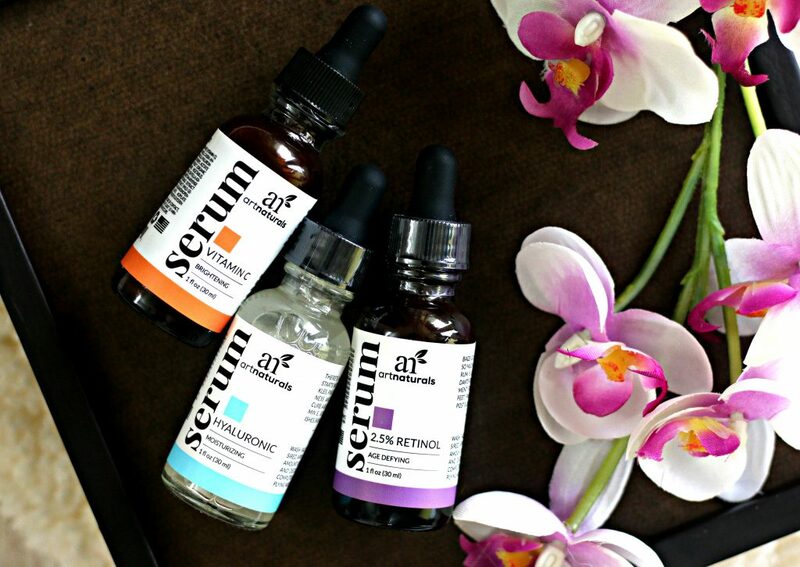 Have you tried Art Naturals Serum Trio Set ? What are your go-to Vitamin C, Retinol and Hyaluronic acid brands ? This trio sounds amazing. I do use Vitamin C, Hyaluronic Acid, and Retinol on regular basis from different brands like SkinCeuticals, Kate Somerville and Perricone MD. These ones sound gentler and effective too. I will definitely check these out. I am a major skincare addict and love finding new brands that work. I have been using Hyaluronic acid and retinol in my skincare on regular basis and need to add vitamin C for brightening. Retinol has no side effects? Wanted to try for a while but somehow I am little scared when it comes to that. Your sister will thank you later. This is the right age for her to start using the anti-ageing products. I am glad my post helped you choose the right gift for your sister. I haven’t used any of these. Want to use a vit c serum. But it madness skin more prone to tan. Do introduce these to your skincare routine. yes. It’s absolutely mandatory to use a sunscreen before stepping out . Also, I suggest to use a sunscreen even if you stay indoors. Any anti-ageing product makes your skin really sensitive towards sun. And, you can’t ever skip it. Thanks Grace. Yes, the bottles and the packaging labels are all awesome! I have never tried this brand but do use these types of products in other brands. You can never be too young for anti aging products in my opinion. Totally agree. Even I mix and match a lot of skincare. I don’t stick to one single brand. That’s totally true. Yes, gift sets are a great way to try out different products from the same family. I love to mix and match these and so, I also mix them along with my other moisturisers etc. Are these like the remedies from Bobbi Brown? Like more concentrated? They are not over concentrated. They are perfectly blended so as to use directly on skin. You don’t necessarily mix them with other products. I like to layer my products .I follow deciem thumb rule. Cleansing, toning , serum, and then oil based or creme based moisturiser. Day time – Sunscreen after toner is a must for me. First layer sunscreen and every other products. At night, Retinol . Hyaluronic acid alternate days. Retinol thrice every week as I have a super sensitive skin. <3 yeah summer time is the worst time for skin. I hate summer time skincare. It's a time when I don;t like to layer products. I prefer light weight moisturisers. Good that these are not greasy on skin. They blend onto skin in seconds. !